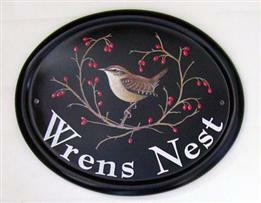 We offer several different ranges of House Signs. Each range offers a unique look and is offered in various sizes. Many of our house sign designs can be customized further with various background colours, font styles and text layouts to suit most signage requirements for your home. It is usually not too difficult to spot the House Number or House Name for a property in daylight, but at night they can sometimes be impossible to see from the road. - First time visitors can end up having to drive slowly up and down the street searching for any visible sign of a house number so they can then at least get a bearing and count up or down from that location to get to the correct address. - Searching for a property in a road with just House Names and no House Numbers is even more difficult as there is no logical sequence to count up or down by in streets with just house names. 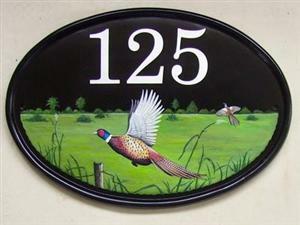 The brass oval house number plaque shown below is made by one of our competitors. It is very popular in the UK and available at most good DIY stores for around £20. 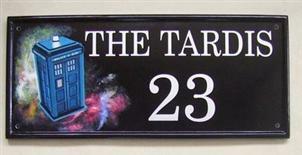 Our Reflective house signs are different..... They have been developed with visibility in mind. 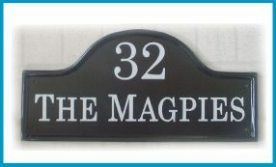 At £19.95 our equivalent sized small classic oval number plaque looks good and reads well in daylight. 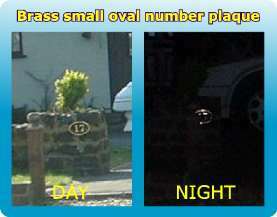 The number plaque above reads quite well in daylight, but even with a powerful camera flash pointed directly on the plaque, it is difficult to make out where it is located at night and it is not possible to read the house number at all. 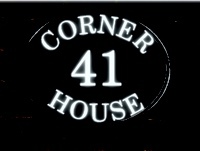 Paramedics, Police, Fire Fighters, Doctors, Taxis Cabs, Delivery Personnel & Take-out Food Drivers - have the same problem trying to locate an address at night - They can get to a street reasonably quickly but once in the street they have to find the exact location of the house which can be quite time consuming. Even when searching with powerful flashlights It can be very difficult for them to spot and read an ordinary house number or house name sign from the road in the dark. This can mean wasting vital extra minutes searching for the house location - that’s OK if you don't mind having luke warm Pizza delivered but it could mean a matter of life and death in some 999, 911 emergency call outs! 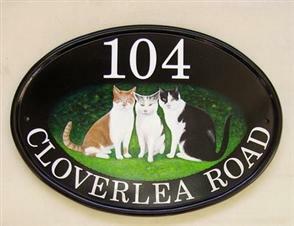 ALL House Number and House Name Signs in this range have Reflective numbers and lettering. Our reflective house signs not only look good in daylight but can also be seen more easily at night compared with normal house signs. This helps first time callers to your home find you more easily during hours of darkness. 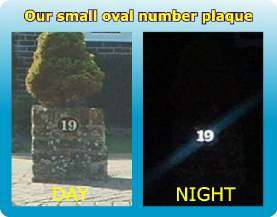 A layer of millions of micro 'cats eyes' embedded in the white text and numbers reflects and focuses any light that is shining on them back to the observer making the numbers and text stand out in the dark. 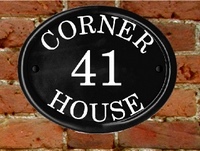 - Our House Signs don't need batteries or power and won't annoy your neighbours by shining brightly constantly - they work similar to modern road traffic signs or the white reflective night safety tape that shines up brightly on outdoor garments. In daylight the lettering looks like normal sign writing, at night the lettering has an ambient shine when placed close to light sources and when observed from a distance with light source like a flashlights, car headlights, street lighting etc they shine up bright - so helping 999 / 911 emergency crews and other first time visitors find an address more easily. Our bespoke rectangular traditional slate house signs are available in a range of sizes and letter styles to suit your individual requirements. Every sign is handcrafted from a solid piece of dark grey slate with unique natural slate grain characteristics. The swirls and grains in each slab of slate are unique. The front face is machine polished (honed) bringing out the beautiful grains and swirls. The average thickness of our solid slate signs is around 10mm plus or minus 0.5 mm. Unlike other companies that offer shallow laser marking or flat sandblasted engraved signs, our house signs have smart v-carved engraving. The v-carved engraved letters and numbers are offered in a choice of white, gold or silver paint . 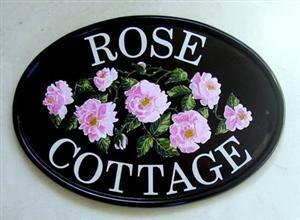 We can also a offer range of decorative borders, arrows or simple decorative engraved motifs by request. We offer a free professional design service with every order to give you the best text layout option for your individual house sign and a proof will be sent by email for your approval. 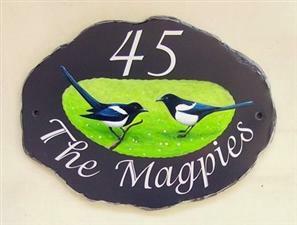 These durable, maintenance free solid slate house signs are handcrafted at our house sign studio on the Isle of Wight and carry a 2 year worldwide guarantee. 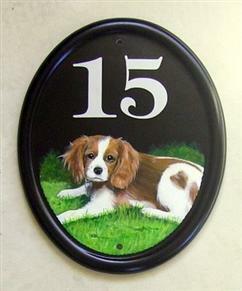 ALL House Number and House Name Signs in this range have Reflective numbers and lettering. 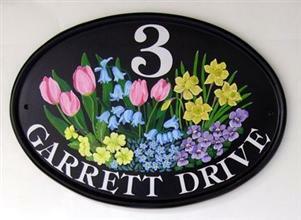 Our custom painted pictorial house signs are all individually painted by fine artists. 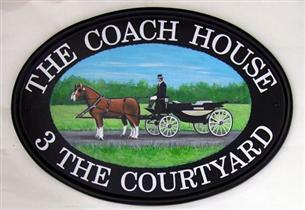 Each one is unique and we can paint any subject onto a selection of our base plaques from the reflective house signs range.